The Flame of Tomorrow (希望の火?, lit. 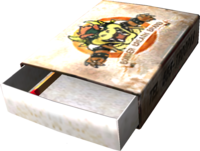 : "Fire of Hope") is a treasure in Pikmin 2 and is actually a container of "Bowser Breath" brand matches (referring to Bowser and his fire breath, Bowser being the main antagonist of Nintendo's Mario series), which roll around when the box is moved. In Japan, the brand is called "Sun Breath" instead. It is found on sublevel 4 of the Citadel of Spiders, occurring in one of a few specific places, such as in an alcove or a pipe. A few Hermit Crawmads and Water Dumples may get in the way, so make sure they've been defeated before retrieving the treasure. One side of this box states "TEL 555-TROOPAS". It is tied for the least valuable treasure in the game. The Flame of Tomorrow being analyzed. The Japanese model for the treasure. The Japanese version of the treasure being analyzed. 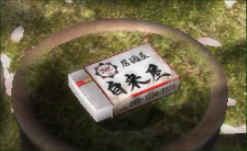 A box with matches from the real world. This page was last edited on January 14, 2019, at 00:32.